This is a joint giveaway with Code Name: Mama, Hobo Mama, and Natural Parents Network. You may enter at one site only. Please find the section marked "Win it!" for the mandatory entry and optional bonus entries. This is a combined giveaway of two beautiful homebirth books for children: Mama, Talk About When Max Was Born (ARV $16) and We're Having a Homebirth!! (ARV $8). Two lucky readers will receive a copy of both books, making this giveaway's total value $48! 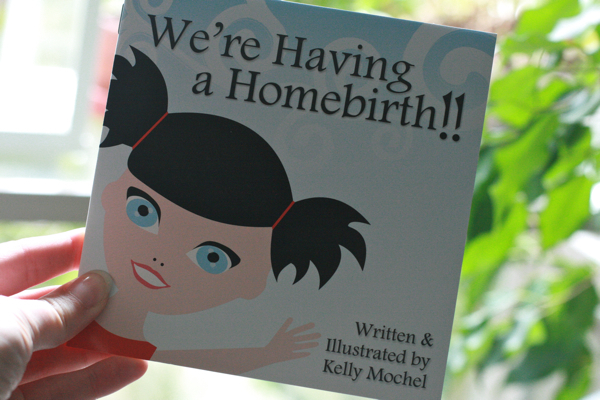 When Kelly Mochel found out I was planning a homebirth for our second baby this past May, she wrote and asked if Mikko, our then-three-year-old, might like to read a children's book she wrote and illustrated: We're Having a Homebirth!! I was not only happy to read it but eager to review it. I had done an extensive scouting out of what our library and bookstores had to offer in the way of preparing siblings for birth. Through that inquiry, I had discovered: There's not much out there about homebirth! Even the most attachment-friendly of birthing books tend to suggest that Mommy will go away to a birthing center. So it was lovely to have a book aimed at children that accurately and simply describes what it's like to have a midwife-attended homebirth, and how an older sibling might be involved in that process. We're Having a Homebirth!! starts off with a little introduction to the pregnancy and midwifery care by a modern-looking woman named Jenny. (I point that out only to demonstrate that, truthfully, midwives don't wear prairie skirts and smell like patchouli … except the ones who do). The narrator is an adorable sprite with black pigtails who is very excited about getting a new little brother or sister. We are quickly bopped into the birth story proper, with Jenny's encouraging coaching and Daddy and the big sister's support. After a natural labor, Mommy pushes out a baby boy and then the placenta. The last spread shows Mommy breastfeeding and a celebratory birthday party for the new baby brother. Tea Collection 4-Day Sale starts today! Tea Collection is offering 15% off orders of 3 or more items for four days only — Thursday, September 22, through Sunday, September 25. You can even mention this offer at a participating local store! There's one near us that has a huge stash of Tea clothing that had me drooling. Head to TeaCollection.com to find one near you. I'm so excited to introduce one of our new sponsors to you, Ink Garden customized printing. Ink Garden promises "stylish designs you customize," and it holds true. Looking around the site, I was struck by how chic the designs were — and how many varieties there were! You can tell the company takes design seriously, because every item is tagged with the graphic artist's name and bio. Birthday greeting cards & invitations. Cards & invitations for baby showers, bridal showers, weddings, graduations, and other special occasions. Christmas, Hannukah, and other holiday greetings. Use the provided designs, or customize with your own family photos.